When we backpacked in Iraqi Kurdistan there were a load of just random places we visited and memories to last a lifetime. Just small little things that seemed quite cool. First of all, Iraqi Kurdistan is a fairly safe place for travellers. It’s different to the rest of Iraq and if you’ve read my countless posts on Iraq you will know that. Backpacking in Kurdistan – Touring a toy shop in Robia, Iraqi Kurdistan. 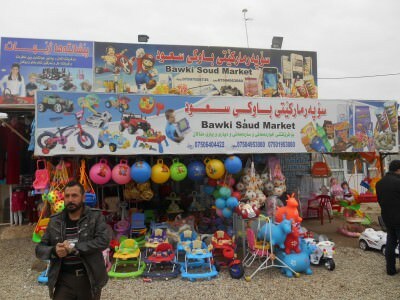 We spent time in Duhok, Sulav, Amadiya, Erbil and Sulaymaniyah, as well as passing through Kirkuk, Qadash and the random village of Rabia or Robia. Robia is in the middle of nowhere – it’s an odd place and to be honest it didn’t make it onto my maps, nor could I find it online after our visit. Similarly to the times I passed through the towns of Jonglu and Chongkang (both in North Korea) while on the North Korea to China train – these are obscure locations that have rarely been written about. We stopped off there on route from Erbil to Duhok. We shared a taxi between Erbil and Duhok as it’s the norm. There are no public buses between towns in Iraqi Kurdistan, some minibuses can be found but we car shared most of the time as it’s the safest bet. 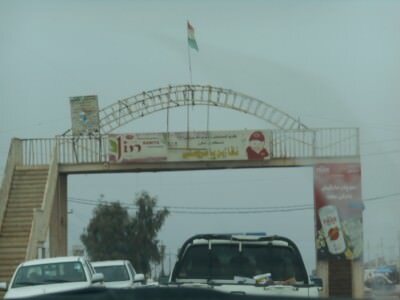 Arrival in the town of Robia in Iraqi Kurdistan. My memory of Robia was a local store which was basically a road side toy shop. 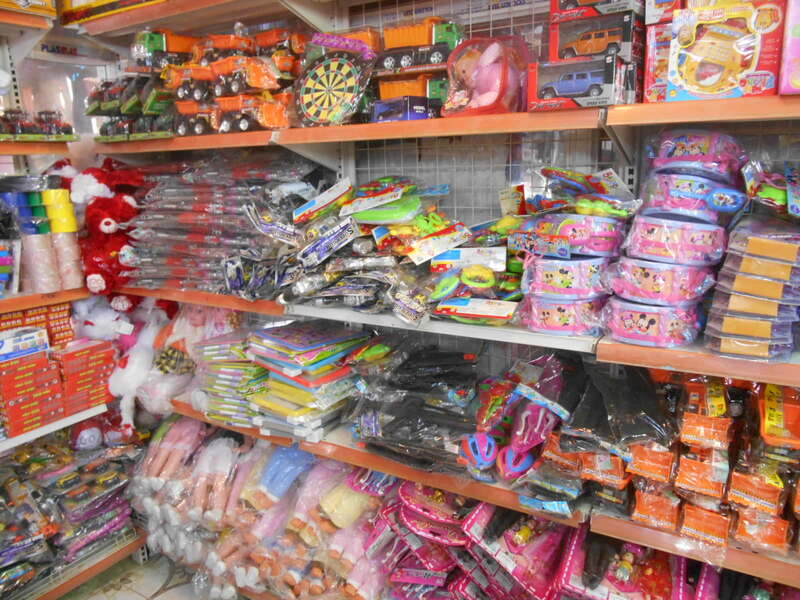 Yes there we were touring a toy shop in Iraq. 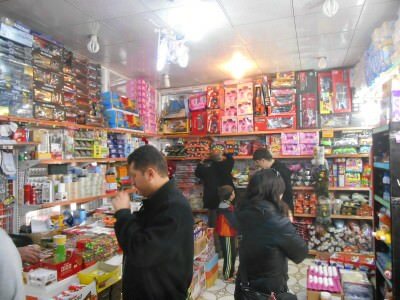 While this will never be the most exciting post ever on Don’t Stop Living and probably the first I’ve ever written on a toy shop, hopefully it gives those who haven’t been an idea and some proof that life in war zones goes on as normal. What was the toy shop in Robia called? 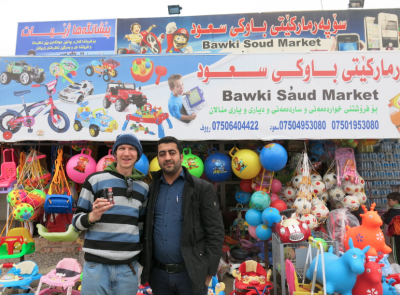 Surprisingly it was a newsagent and a toy shop all in one and had a name of Bawki Saud Market. 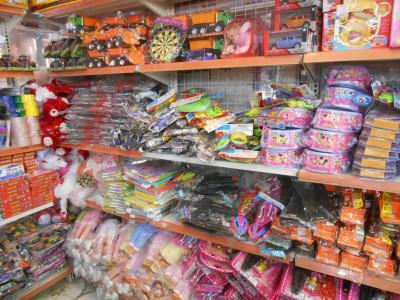 What items were for sale in the toy shop? 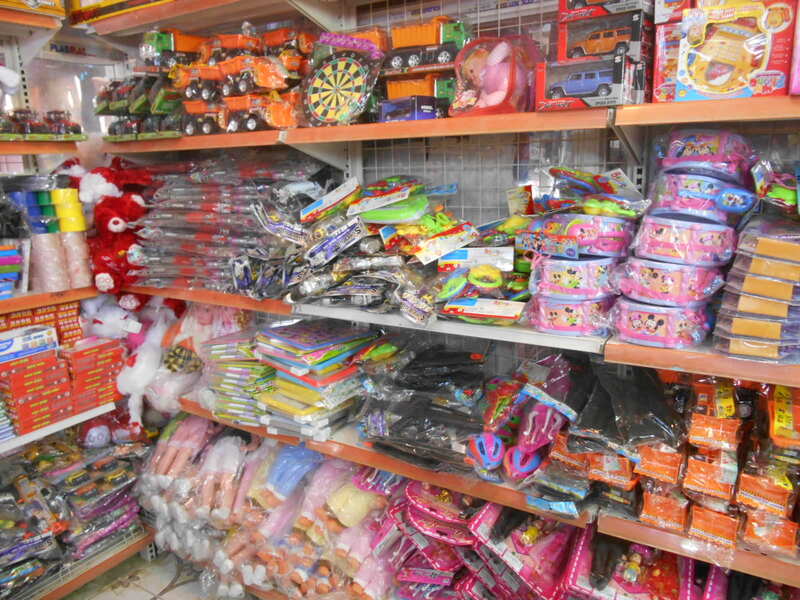 What’s in a Kurdish toy shop? The two guys that shared our car along with the driver were cool blokes. The guy beside me was called Kilif and chatted away to me as best he could. We tried to hold a conversation and Kilif refused to take any money for the drink he bought me – a mocha coffee. Kurdish people are very very friendly and welcoming. With my new Kurdish friend Kilif. Any other noticeable sights in Robia? 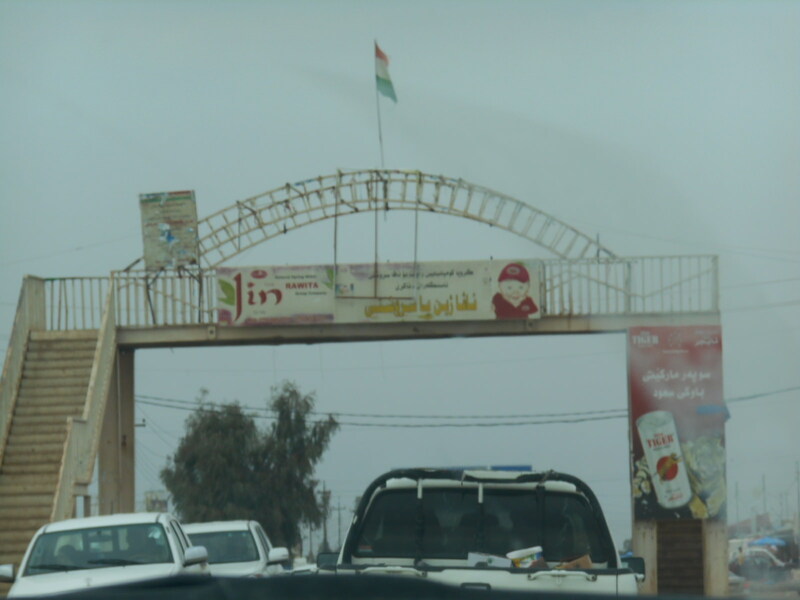 Robia was a small place and we didn’t stay for long – maybe 20 minutes or so, but there was a statue on a roundabout, a massive Kurdish flag, a Mosque and some checkpoints on the way in and out of the town. 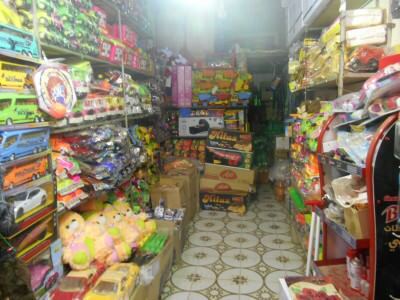 That was all we saw of the place aside from this toy shop. A statue and a Kurdish flag in Robia. OK so a short and sweet visit to Robia and the toy shop, but just one I thought would be quite unusual to type up for you all today. 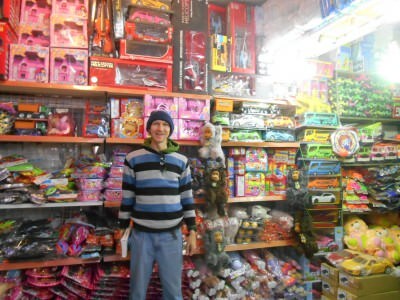 If you have been to this toy shop, or to Robia, please comment below as I would love to hear whether the name of the town is in fact Robia or if anything I have written is actually correct! 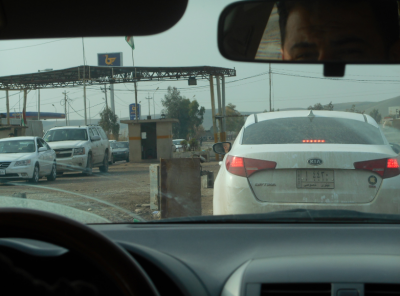 There is still a bit of an enigmatic feeling when traveling in Iraq, whether it’s the Kurdistan region or not. 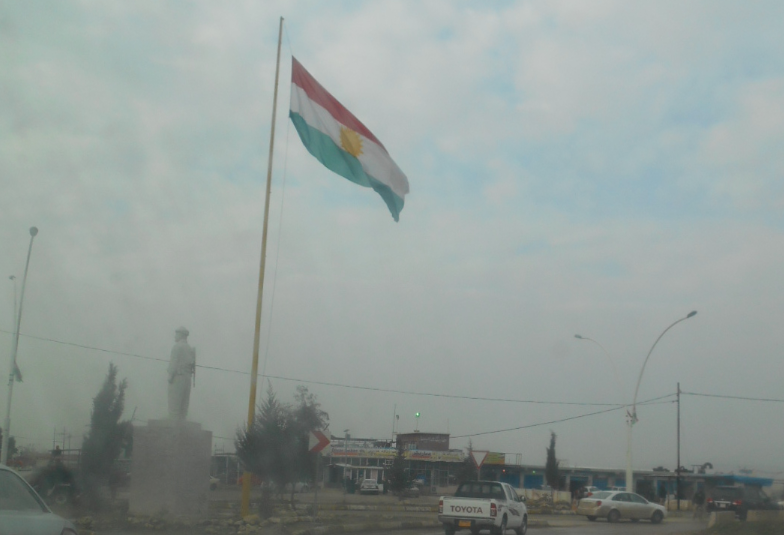 After having a coffee and a few more security checks we were back on the road to Duhok. Here’s a video of the toy shop in Robia. This entry was posted in Central Asia/Middle East, Destinations, Dohuk, Duhok, Erbil, Iraq, Kurdistan, Robia. Bookmark the permalink. Looks good. What type of toys usually do they have?